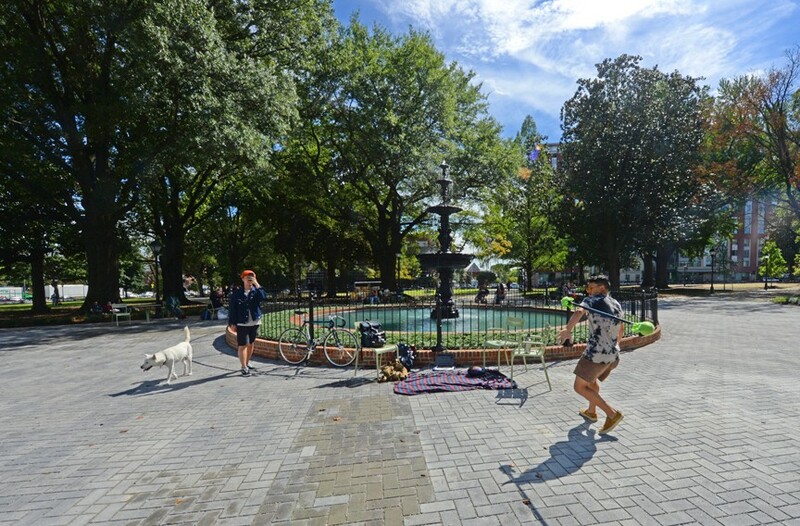 Opinion: With the reopening of Monroe Park, a promising public space emerges | Cover Story | Style Weekly - Richmond, VA local news, arts, and events. 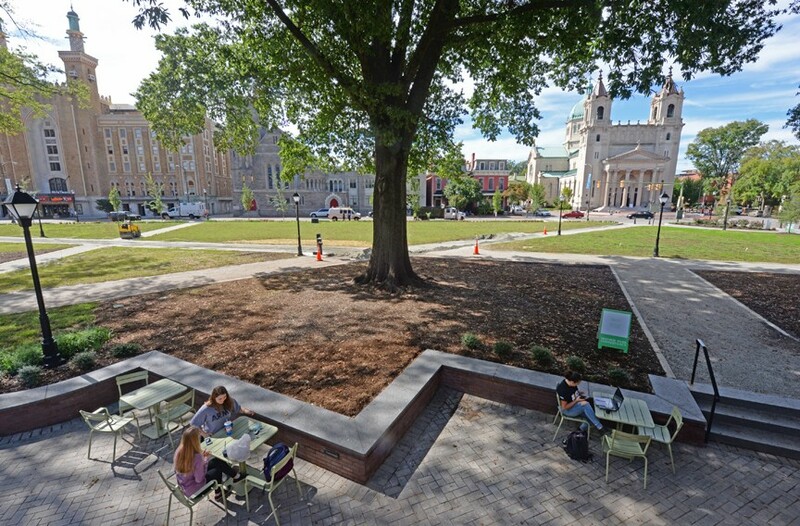 Like Rip van Winkle, who slumbered for 20 years and awoke to startling changes, the public was given the big reveal of the 7.5-acre green space Sept. 27 after a 22-month hiatus when the park was cordoned off for a major, $6.3 million restoration. 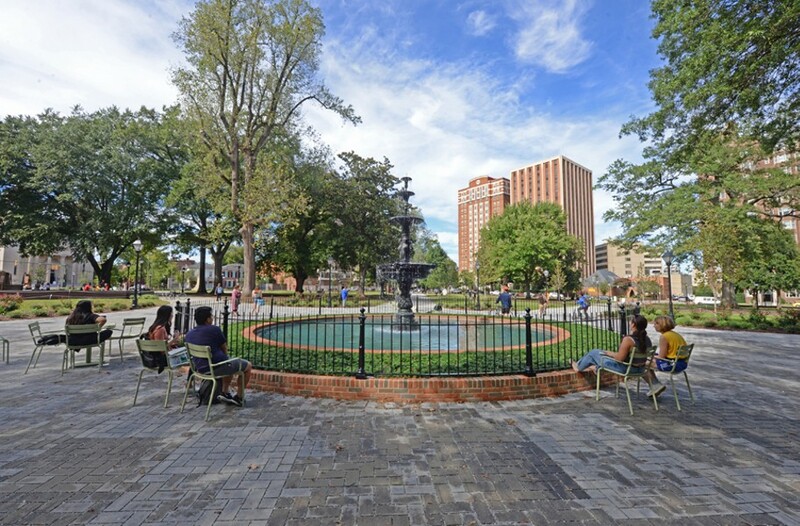 Many familiar features and landmarks, under the direction of the City of Richmond, Virginia Commonwealth University and a newly formed, not-for-profit entity, the Monroe Park Conservancy, have been renewed. There are welcome amenities and long-needed updates. And while my first impression is that too much of the mature tree canopy has been removed, 132 new trees and 130,000 new plants and shrubs have been added. I know, what about the homeless people? Why were power boxes installed hard up against the rear brick wall of the World War II memorial (did the planners think no one would notice?) And will there be more park benches? New gray-hued and oversized bricks give way to crushed stone on the walkway leading to VCU’s Brandt and Rhoads dormitories. The thing is, for two generations Monroe Park has been more of a no-man's land than anything close to reaching its potential as a crossroads or outdoor destination of beauty and civic pride. It is city-owned, but heretofore given minimum attention. Virginia Commonwealth University named its western campus for the Victorian-era pleasure park, but without ownership invested little in its upkeep. The homeless didn't have a problem with any of this and adopted the space as their own. And in a community that has mostly looked away, if not askance, at how to address these residents, the general population ceded the park to them by default. 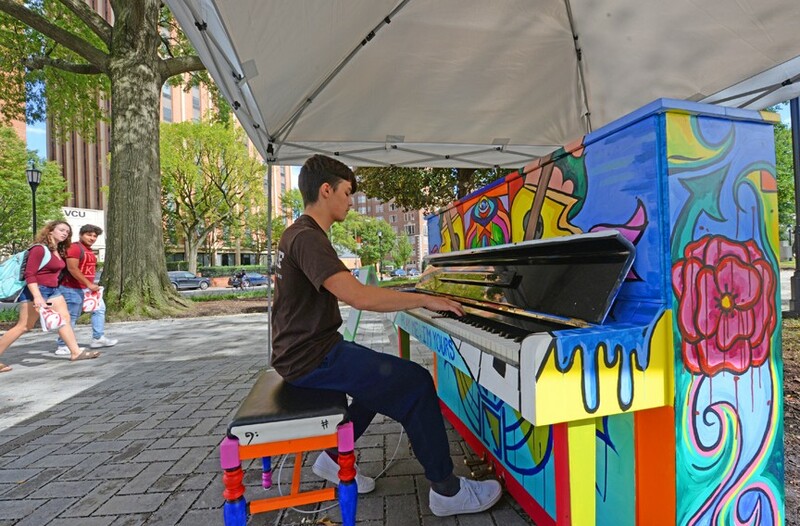 Michael Reinhardt, 18, a VCU freshman majoring in mechanical engineering, plays on a colorful piano in the park. He says it’s now much easier getting from his dorm to the building that houses his classes. There were other things at play. Unlike comparably sized, American urban green spaces such as Rittenhouse Square in Philadelphia or Bryant Park in midtown Manhattan, historically flanked on all sides by consistent street and building types, Monroe Park was encircled by a hodgepodge of building types and population groups. The north side, along West Franklin, was largely upscale residential. The south side, along West Main, a mix of working class houses, retail and warehouses. North Laurel was institutional and formal with the Altria Theater, formerly the Mosque and Landmark, and two major churches. And the eastern side was especially problematic. It was a dead zone with no structures facing or opening onto the park, and Belvidere supporting six, relentlessly and heavily trafficked lanes of U.S. Route 1. Newly installed retaining walls accentuate slight grade changes in the park and provide additional seating. Evolving technology also played a part in Monroe Park's dwindling fortunes. In the 1950s and 1960s, the availability of air-conditioning meant that residents of both the north side of the park and Oregon Hill no longer relied on this fresh-air escape hatch as they once had. In response, the city's recreation and parks department halted supervised parks programs in the early 1960s. Of course, it didn't help that one evening in 1959, Austin Dodson, a prominent local physician, was killed in the park. The place was immediately decried as a haven for nocturnal criminals. Park benches were removed and there was even talk of transforming the space into a medical center. With this negativity, it's not surprising that few complained when 2 acres of the park's eastern edge were shaved off for adding more traffic lanes to Belvidere. 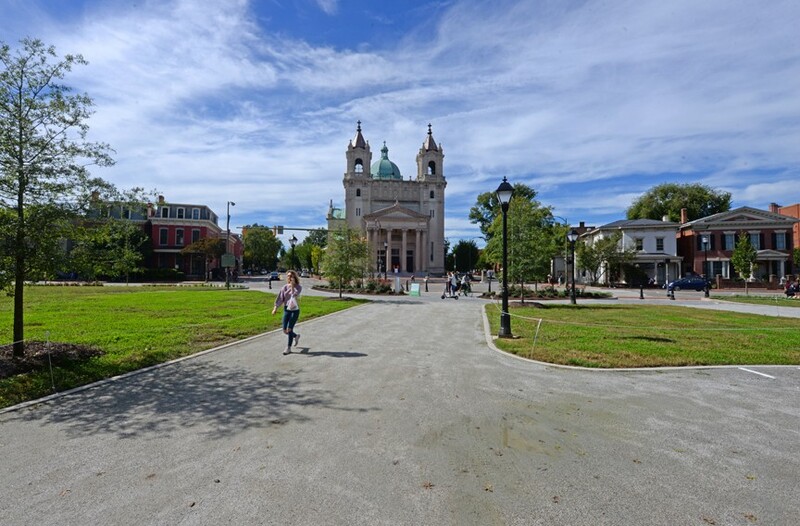 The Cathedral of the Sacred Heart on North Laurel Street, completed in 1906, is among the landmarks now viewed through a new lens with the park’s renovation. But more negative juju befell a decade later. In May 1970, as VCU students were celebrating the end of the semester at a rock concert in the park, 17-year-old William Donivan crawled over the spiked fence of the multi-tiered fountain, made his way to the top for a better look. He and another teen began shaking the cast iron fountain back and forth. The stem broke and Donivan fell into the 18 inches of water, crushed and pinned face down. He died. On a cheerier occasion, a few years later, Walter Sullivan chose to cap his installation as the bishop of the Catholic Diocese of Richmond, with a celebratory picnic in Monroe Park, symbolizing his bishopric's embrace of the wider world. The park was also the scene of such polarizing rallies as Gloria Steinem's appearance for women's rights and future presidential first daughter Maureen Reagan's stumping on behalf of the re-election of President Richard Nixon. 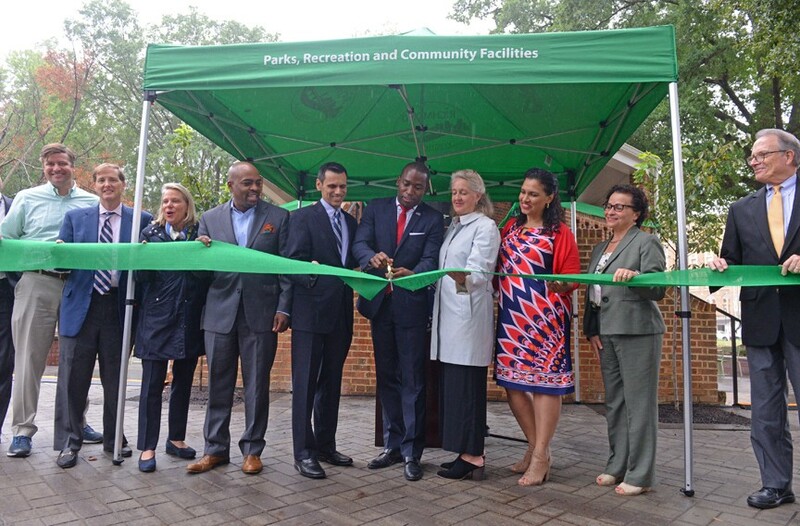 Mayor Levar Stoney cuts the ceremonial ribbon Sept. 27 to reopen Monroe Park after a 22-month restoration. Among other dignitaries he is flanked by Michael Rao, VCU president, and Alice McGuire Massie of the Monroe Park Conservancy. But by the end of the last century the park was worn down and neglected. 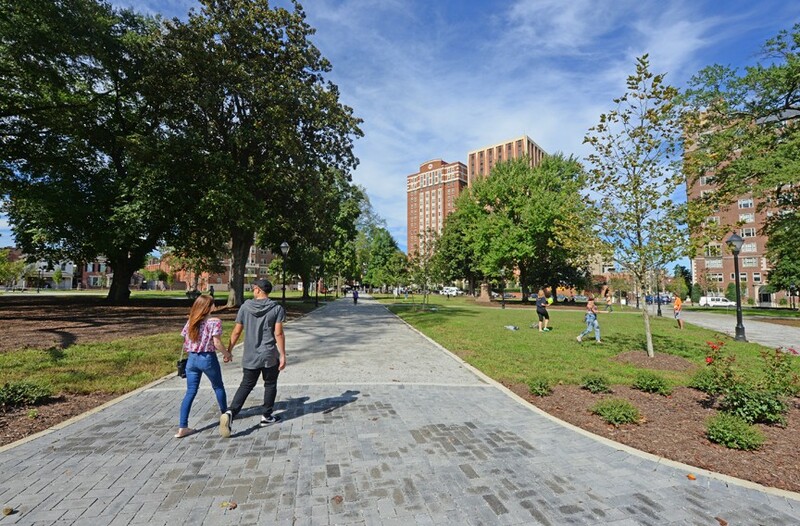 Even VCU students — still open-space-deprived — who wished to throw a Frisbee or toss a football were thwarted by gutted sidewalks, exposed roots and the treacherous concrete curbing of too many walkways. Sun bathers were deterred by, if only a perception of, leers from the park's only consistent population, the homeless. 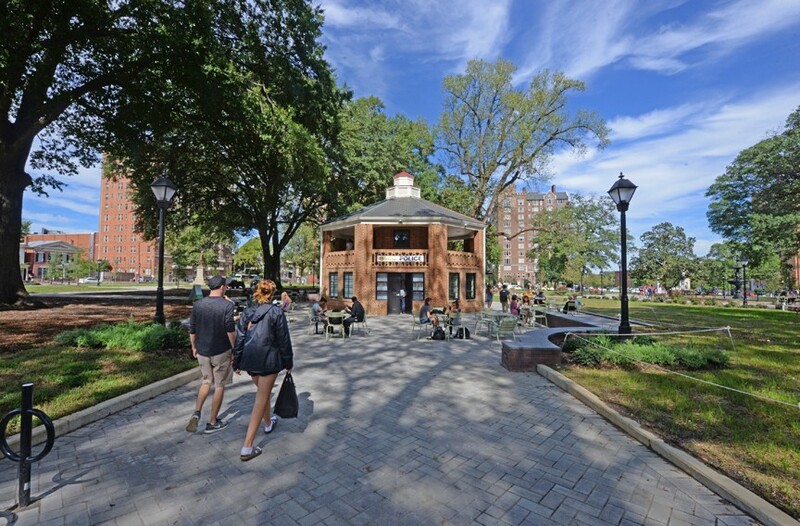 The Checkers House, built in 1939, will be re-purposed as a campus police substation and a cafe. But with the advancing 2000s, much change had come to the surrounding blocks. The glorious Moorish detailing and infrastructure of the Landmark Theater was given a major makeover and its marquee renamed the Altria. The university's Brandt Hall, another high-rise dorm, was added on West Franklin. Nearby, the venerable Prestwould grew in appeal as one of the city's choicest addresses. On West Main, a former storage company gave way to the new VCU School of Engineering. And recently, a new Gladding Residence Center brought to 1,500 the number of students residing along this stretch. The familiar cast iron multitiered fountain remains a central focal point of the park. If the Belvidere Street side has grown only more heavily trafficked, the university has now leapt the highway with major new buildings. These house the business school, dorms and additional engineering school facilities. And just a few blocks away, the Jefferson Hotel, threatened with demolition in the 1980s, has emerged as a hospitable point of civic pride. Finally, the VCU Institute for Contemporary Art, now getting its legs at Belvidere and Broad, delivers architectural gravitas and much-need place-making to its frenetic intersection. 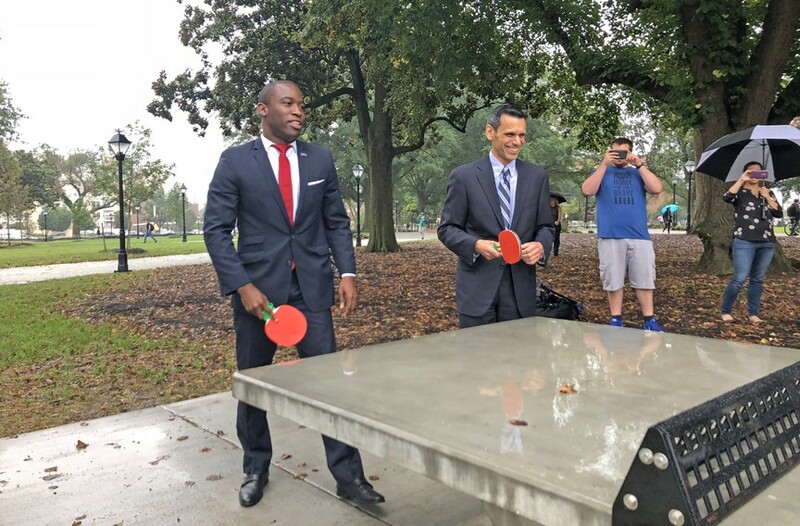 Ping-pong diplomacy: Mayor Levar Stoney and Michael Rao, VCU president, inaugurate the park’s table tennis amenity on Sept. 27. The city owns Monroe Park and the university will assist in maintaining it. So now, for the first time, well, since the embrace of air conditioning, Monroe Park makes sense as a central place of assembly to be fed by pedestrians coming from all directions. Many ancient cities in Africa or medieval Europe have crowded neighborhoods that contain a hodgepodge of human activities and buildings. They offer little open space, that is, until a street or passage suddenly opens onto a piazza, plaza or park. These places offer refuge, relief and often refreshment. Monroe Park has been that kind of place — and it's back. After an extended nap, it's potential is great as Richmond grows in population and ambition. Opinions expressed in this story are those of the writer and not necessarily those of Style Weekly. 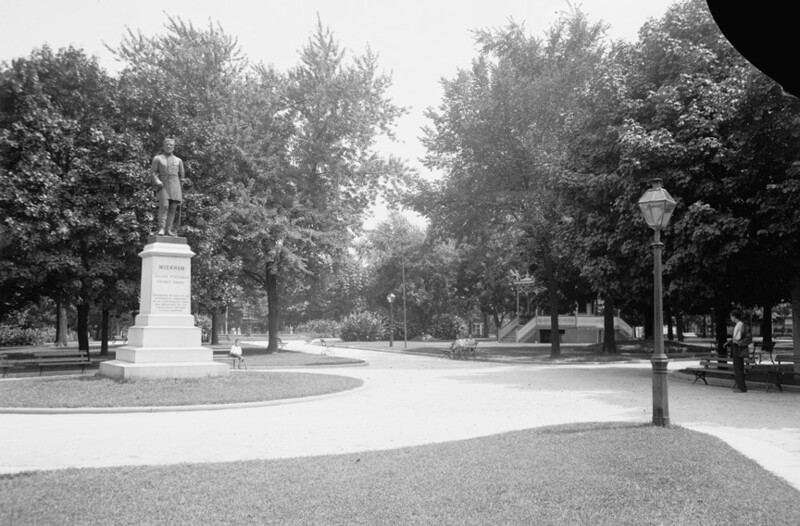 The statue of Richmond lawyer, Confederate general and Chesapeake and Ohio Railway president, Williams C. Wickham, is one of a number of monuments at park intersections, as seen in this photo from the early 20th century. 1853 Western Square is established as one of Richmond's earliest city parks. Today, the 7.5 acre tract is bordered by Main, Belvidere, North Laurel and West Franklin streets. Eventually, it is renamed to honor James Monroe, the fifth president (in 1858 his remains were brought from New York and reinterred in Hollywood Cemetery). 1861-1865 During the Civil War, Confederate military training exercises are held in the park and South Carolina troops are stationed there. 1865-1869 Tent hospital established for Union troops occupying Richmond. First baseball games in city held here circa 1869. 1894 Park is landscaped with "young and thirsty trees" to better serve residents moving into nearby neighborhoods as electric streetcar service improves. 1884 Hedges are planted on the edges of the park. 1891 Statue of Williams C. Wickham, by Richmond sculptor Edward Valentine, is dedicated, erected from funds given by Confederate army veterans and employees of the Chesapeake and Ohio Railway Co.
1899 Concrete curbing is installed along walkways. 1908 Sandboxes are installed in children's play area near Main Street. 1911 Statue of Joseph Bryan, publisher of the Richmond Times-Dispatch and Richmond News Leader, is dedicated. Sculptor is William Couper. Greek cross monument installed to honor Gov. Fitzhugh Lee's service in the Spanish-American War. 1920 Station house is erected near Belvidere Street for city's central fire alarm equipment. The structure is demolished in the early 1970s for the widening of Belvidere Street. 1923 Sidewalks paved in asphalt. 1933 Eighty park benches are installed. 1939 Eight-sided brick park house, now known as the Checkers House, replaces former 1890s frame facility. 1944 Memorial to World War II dead, designed by Charles Gillette, is dedicated. 1951 Hedges surrounding park removed, borders replanted with flowering trees and shrubs. 1960-1962 Some 50 park lamps are installed. 1961-1970 Irrigation system is installed in park. 1960s to 1980s Rock concerts in park include performances by Iron Butterfly, Bruce Springsteen and Jerry Lee Lewis. 1990s Food not Bombs starts serving meals to Richmond homeless people in the park. 2008 The Beastie Boys and Sheryl Crow show up to rock to vote as part of a get-out-the-vote push in swing states. 2016 Park closes in November for restoration. 2018 Monroe Park reopens Sept. 27 after $6.3 million restoration under stewardship of Monroe Park Conservancy.